Butter Cakes. 1 pint milk 1 pt corn meal. 2 eggs beaten light, a little salt. Grease the griddle with lard & fry cakes crisp & brown. 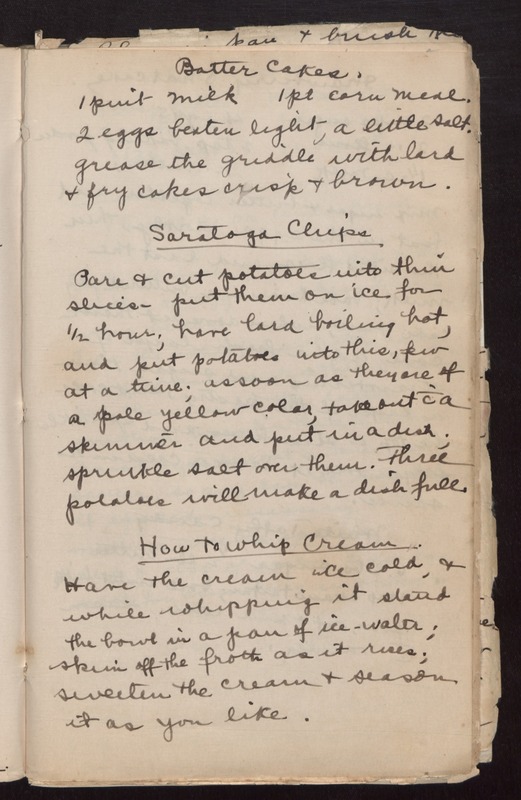 Saratoga Chips Pare & cut potatoes into thin slices - put them on ice for 1/2 hour; have lard boiling hot, and put potatoes into this, few at a time; as soon as they are of a pale yellow color, take out '/c a skimmer and put in a dish; sprinkle salt over them. Three potatoes will make a dish full. How to Whip Cream. Have the cream ice cold, & while whipping it stand the bowl in a pan of ice-water; skim off the froth as it rises; sweeten the cream & season it as you like.